How to replace the oil tank on an ‘Oil Sistem’ brand powerpack, on a Simpro Multi-Tip bin lifter. Replacement 1-litre hydraulic fluid tank. Ensure the cradle is fully lowered, turn the key switch ’Off’, and remove the main cover panel. Remove the 2 bolts holding the powerpack. There are several types of mounting bracket; if there are holes in the ‘front’ of the powerpack box, use a socket with extension to undo the bolts. 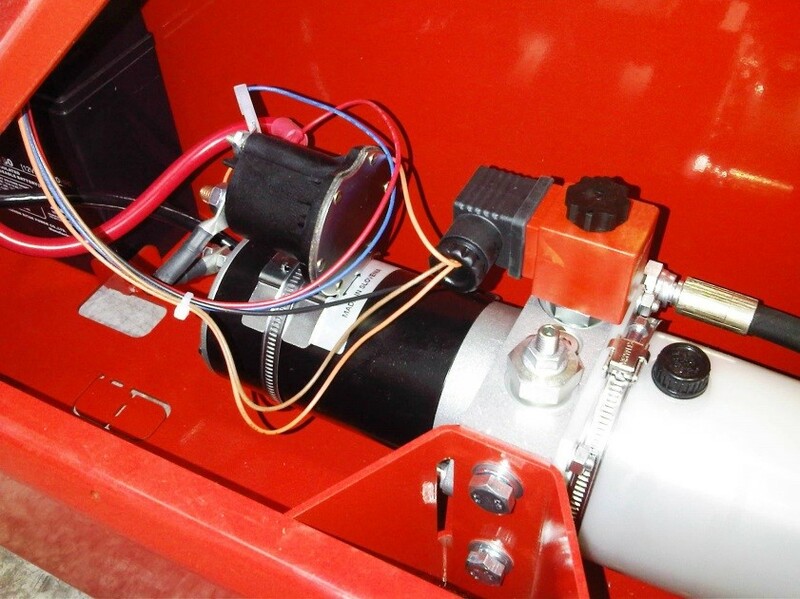 Undo the swivel fitting on the hydraulic hose, which attaches it to the powerpack. If a ¼” BSP plug is available, temporarily screw into the hose to stop oil leakage. If not, wrap with some tape or a rag and tie with the fitting as high as possible. Lift the powerpack out of the machine. Loosen the hose-clamp around the top of the tank, and remove the bolts at the corners. Note the position of the filler plug relative to the powerpack. Inspect the suction strainer; if it is not completely clean we recommend that it be unscrewed and cleaned thoroughly before reassembly. Swap the hose clamp onto the new tank, and push onto the powerpack housing with the filler plug correctly aligned. Fit and tighten the bolts and nuts, and tighten the hose clamp. Note that the clamp screw should be at the top (approximately in line with the filler plug). Remove the filler plug and pour approximately 600ml of hydraulic oil into the tank. Check that it is not leaking around the top flange. Ensure all oil is cleaned from the outside of the powerpack and from the machine. This is necessary so if there are any leaks when the powerpack is refitted, they will be immediately obvious. Put the powerpack back in place, reconnect the hydraulic hose, and refit and tighten the mounting bolts. Reconnect the battery cables and wiring loom plugs. Raise and lower the cradle several times, then take it to the top and keep the ‘Raise’ button pressed for about 1 second to ensure the system is pressurized fully. Leave for several minutes then examine for leaks. If there are signs of leakage repeat the complete procedure, taking particular care to tighten all bolts securely. If the problem persists some parts may need to be replaced. If there are no leaks, replace the main cover panel.